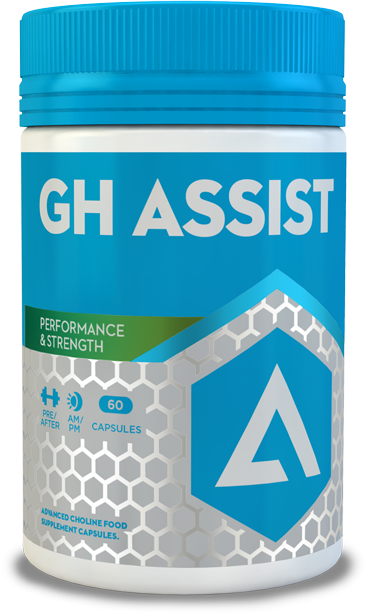 GH assist contains an advanced form of Choline, Alpha-GlycerylPhosphorylCholine (A-GPC) which provides an immediate supply of choline to the bloodstream. Choline is an essential component of all major phospholipids in our bodies. Choline undergoes a process called acetylation, resulting in the formation of acetylcholine, which is one of the most important neurotransmitters in the central nervous system, and responsible for the transmission of communication impulses between neurons. A-GPC crosses the blood-brain barrier to boost choline levels in the brain, and it is involved in the synthesis and release of acetylcholine (AC). This boost of choline and release of AC significantly stimulates cognitive functioning. GH Assist provides a rapidly absorbed form of choline that has been shown to raise free plasma choline levels faster than other choline precursors. Since A-GPC is incorporated into brain phospholipids within 24 hours following absorption, the beneficial memory enhancing effects are fast and noticeable. A-GPC has been shown to stimulate the intrinsic production and release of HGH, likely by elevating AC and then by inhibiting the release of the hormone somatostatin. A-GPC is considered to be an effective “GH Booster”, and therefore has potential to be one of the most significant agents to help maintain healthful body composition, help increase lean muscle mass and strength, help reduce fat mass, stimulate mind-muscle connection and help maintain youthful vigor. Ingredients: In a 2 piece gelatin capsule: Choline (as L-Alpha glycerylphosphorylcholine 50%, 450mg yield), Magnesium Stearate, Brown Rice flour, Microcrystalline cellulose. Other ingredients: This product is food a supplement and should be used in conjunction with food as part of a balanced, varied diet and healthy lifestyle. This product is not intended for use by people under the age of 18. This product is not design to prevent or cure any illness or ailment. May contain traces of milk, gluten and nuts. Do not exceed recommended daily dose. Keep out of reach of young children.